J.R.R. 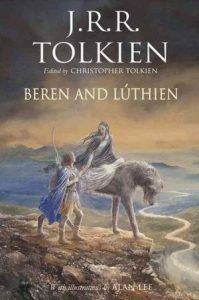 Tolkien’s Beren and Lúthien, edited by Christopher Tolkien, was published yesterday. The book is an attempt by Christopher Tolkien to extract one of the most beautiful, moving, and personal stories of his father’s ‘legendarium’ into a standalone book, allowing the story to shine on its own, as well as showing its development over time. The books is accompanied by stunning illustrations by Alan Lee. I was interviewed about this new book on BBC Radio Wales this morning by Felicity Evans, on Good Morning Wales. I first talked about the personal significance of the story for Tolkien: seeing his young wife, Edith, dancing in a woodland among white flowers near Roos in East Yorkshire became the heart of the tale of the mortal Beren falling in love with the immortal Lúthien. Michael Flowers’ research has added a lot to our understanding of this personal connection and the imagery of this scene – see here for his excellent blog post, including photographs from the location where Edith danced. I actually found it very moving that Christopher Tolkien dedicates this book to his own wife, Baillie Tolkien, especially as he says in the preface that – at 93 – this may well be the last book of his father’s work he will edit. He also mentions hearing the story of Beren and Lúthien orally from his father in the early 1930s and refers to the famous letter his father sent him a year after Edith’s death, saying that his wife “was (and knew she was) my Lúthien” (Letter #340). Famously, the names Beren and Lúthien are inscribed on the gravestone where Tolkien and Edith are buried (Wolvercote Cemetery, Oxford). In my interview I also referred briefly to the creative reshaping of myth and legend in this tale: the union of a fairy woman with a mortal man (a widespread motif in European folklore), and the reversal of the Orpheus myth (Lúthien wins back Beren from the Halls of Mandos, as opposed to Orpheus getting back Eurydice from the Underworld). But there are, of course, many more such examples: Lúthien’s imprisonment in the tree-house brings to mind the tale of Rapunzel, and the hunt of Carcharoth resembles the hunt for the giant boar Twrch Trwyth in the Welsh Mabinogion. The interview then moved towards Tolkien’s popularity and the reasons why fantasy literature is flourishing recently.